Design Ideas: As the project gets more defined the design ideas and sketches will change over time, but our current ideas and concept drawing/CAD models will be posted here. Background: The spherical drive system idea is unlike any other vehicle that can be seen on the road today. Despite having seen spherically driven vehicles in futuristic movies such as IRobot, there has not been a huge push into the realm of the sphere. We believe that the versatility of the sphere drive can give us a whole new degree of freedom and safety that we have yet to discover. As a year long project class for San Jose State University, we will be applying all of the engineering theory/concepts to transform an ambitious and out of the box idea into a physical and marketable product. 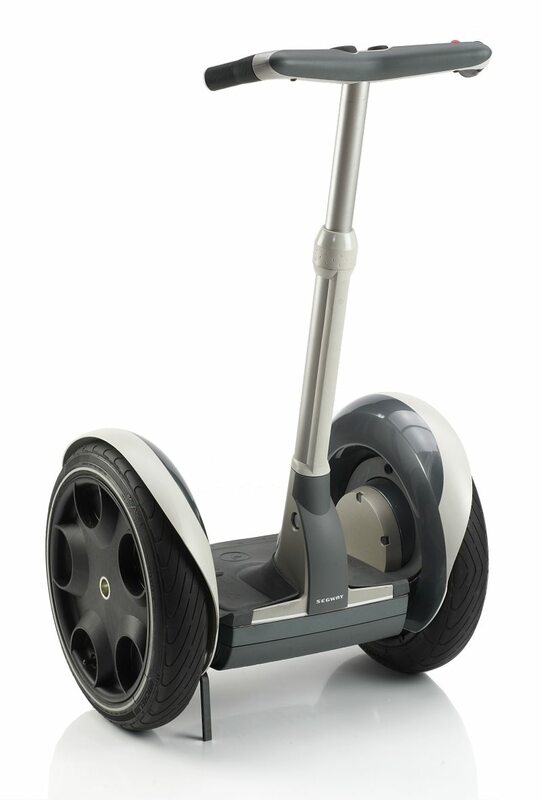 By the end of the school year, the final product will have all of the right hardware and software to enable it to self-balance and maneuver in any direction at slow speeds. Although balancing systems have been developed, adding another degree of freedom both increases complexity but also the possibility of instantaneous response. Wheels - The birth of this project came from the idea of having a vehicle that could travel in any direction, and with it necessity brought about the idea of reinventing the wheel, literally. 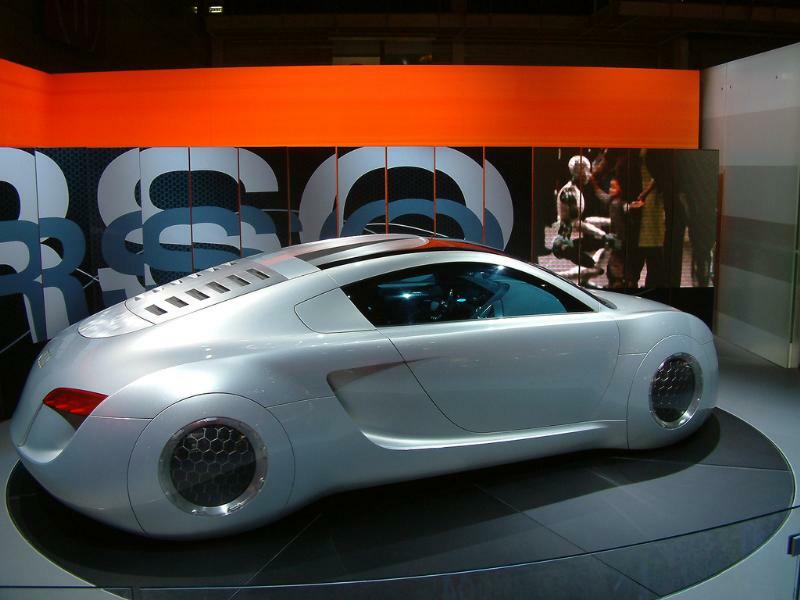 The design of the vehicle does not use conventional wheels, and instead uses spheres. A spheres unique ability to both roll and spin at the same time will give the vehicle truly omni-directional maneuverability. The challenge we will face is that the drive system will be in contact at various points on the sphere, but the sphere itself can be under no constraints except for multiple contact points to keep it within the vehicle enclosure. Drive System - This system is unlike any other omni-directional vehicle in which the transmission to the wheels is done by having a fixed axle, the spherical nature of the wheel means that transmitting power for movement must be done purely with contact friction. There needs to be very minimal wearing effect on the friction drive wheels for non-parallel directions to create a reliable system. This method of driving the vehicle presents many challenges and potential for great innovation in creating a non-fixed axle transmission. In order to achieve the desired speeds and torque from the vehicle it is likely that either stepper motors or BLDC motors will be used for the drive. Control System – The system that will be used to control the vehicle is in no means a trivial task. The principle of operation of the control system is to take sensor readings from a gyro-accelerometer combo, and determine an appropriate response based on the input from the user as well as maintaining stability. The challenges posed by the control system, include an attempt to balance an inherently unstable system, interfacing with multiple drive motors, and combining potentially noisy sensor readings such as those from an accelerometer into something usable and reliable. The immediate scope of the control system will be to maintain balance and maneuverability at low speeds, with considerations taken for a modified high speed control. Power Management – The large amount of electronics onboard of the vehicle will mean that there will be a need to have a very intelligent and reliable way of sourcing the power as needed. The power management system, will need to store energy in a storage medium (likely to be LiPo Batteries), and be able to distribute the energy to the motors, controllers, and sensors. In addition to controlling the distribution of power, the system will also need to monitor itself for any potential faults, as well as ease of recharging from a high voltage source (such as 120V mains). The power management system is the heart of this project and will need to be built and sized for the rest of the systems on the vehicle. 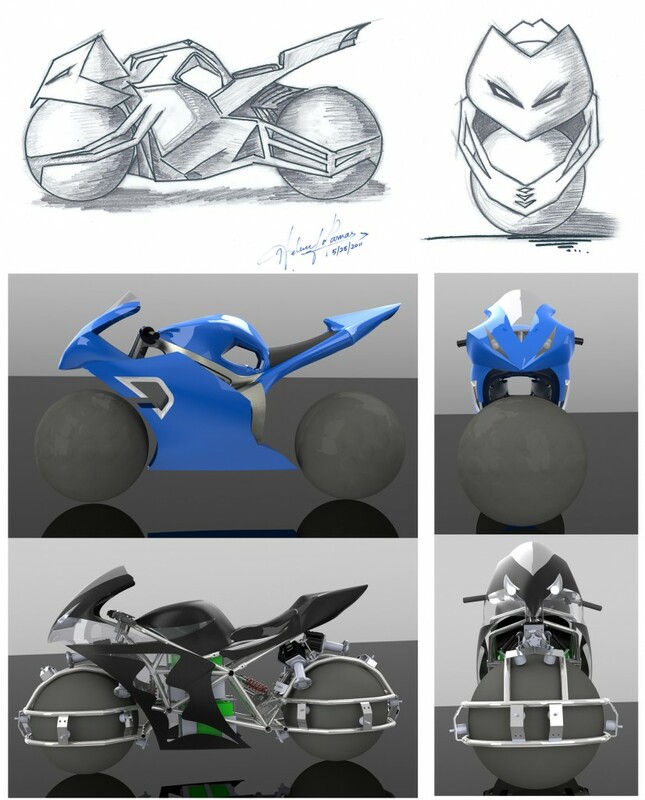 Frame and Body design - While the vehicle uses a very unique drive system, it is still in other aspects a motorbike. To provide unparalleled versatility for our application we will be designing an entirely new frame that will take into account room for the battery system, IMU’s, Control Cards, and space to accommodate the motors we will be using to drive the vehicle. While conventional motorbikes use a single rear swing arm, this vehicle will make use of a front swing arm as well, posing an interesting challenge from a mechanical design perspective. The exterior body of the vehicle will be fabricated using fiberglass & carbon fiber to keep weight down while not compromising on strength and aesthetics. Future Planning: Though the immediate scope of the project is to have a vehicle that can balance and maneuver at low speeds, the ultimate goal is to have a fully functional electric vehicle that will be able to have speed and range comparable to any other vehicle.